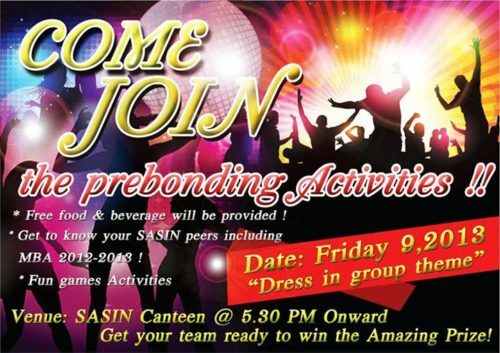 As every year there is a bonding trip being organized by the current 2nd year MBA class at Sasin where the goal is to bond with the people in the 1st year MBA class. While we all go to the same university, have classes in the same building, make use of the same common room, and share the same toilets, there is always a distance between the two classes. We don’t have the same courses till the last quarter, we normally have classes on different floors, and we always speak negatively about each other’s class 😉 . 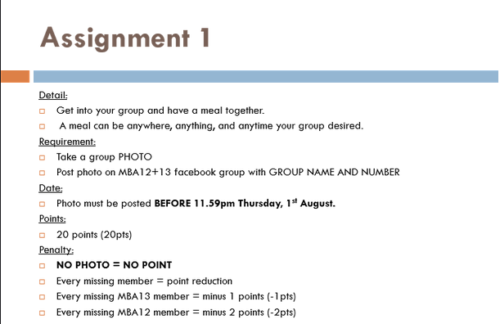 The first assignment was pretty easy since it required the whole group, both MBA 2012 and MBA 2013, to come together for a meal and take a group picture; in case people were missing some points were deducted. 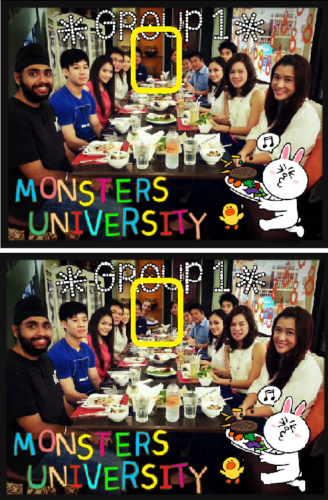 Since there was no requirement what kind of meal it had to be some groups decided to sit in the canteen around a banana and call that a group meal while other groups actually went to a restaurant somewhere for some real food. Unfortunately I was unable to be at the group lunch due to class, which would result in a deduction of 2 points, but that was nicely solved in typical Thai style by cheating. With the help of Adobe Photoshop Elements we did not lose any points for this assignment. 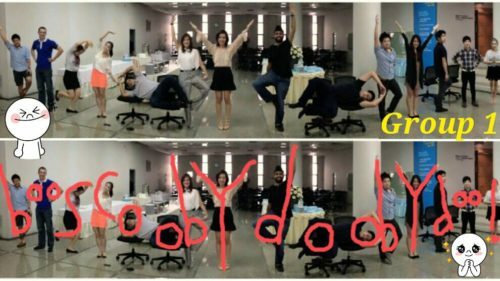 The second assignment was to participate in several activities on a Friday evening in the Sasin canteen: think of several drinking games like building a tower with empty beer cans and flip cup. Of course my team won clearly in the beer tower building competition but we got screwed over by the organization since the rule changed from building the longest (sic) tower into building a tower as quickly as possible. 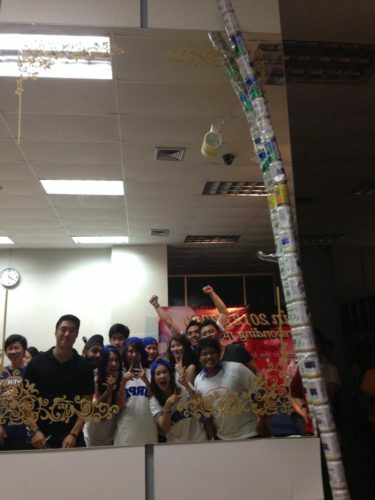 By far the longest tower; and nobody had told us the tower should be freestanding so we just taped it to the wall. The third assignment was to make a short video with all team members in it and the one with the most votes on Facebook for their video would win this competition. Since most of the videos were in Thai or were referring to Thai series or Thai news items I cannot comment more on this since I was unable to follow what was going on. I am pretty sure that nobody will get an Oscar nomination soon though. And finally there was one more assignment where we had to get the whole group together again to shape your body to look like a letter to form a word (you know what I mean). Some groups took this opportunity to show their most perverted side by spelling words their mother would not be proud of or by posing in such a gay way that gossip just had to start. With little effort we formed the longest word scoring an extra 2 points and with help of Adobe Photoshop Elements we made sure our group was complete to not get any points deducted. Probably to keep the number of complaints down, as I would complain about something for sure, the final scores were kept secret. But I guess my group has done pretty well since we did not perform badly on any of the assignments. Next stop will be the actual bonding trip.